In this video, we are going to solve fractional equations, such as , by using the least common denominator. Now, let’s solve it like any other equations. Subtract 24 from both sides. 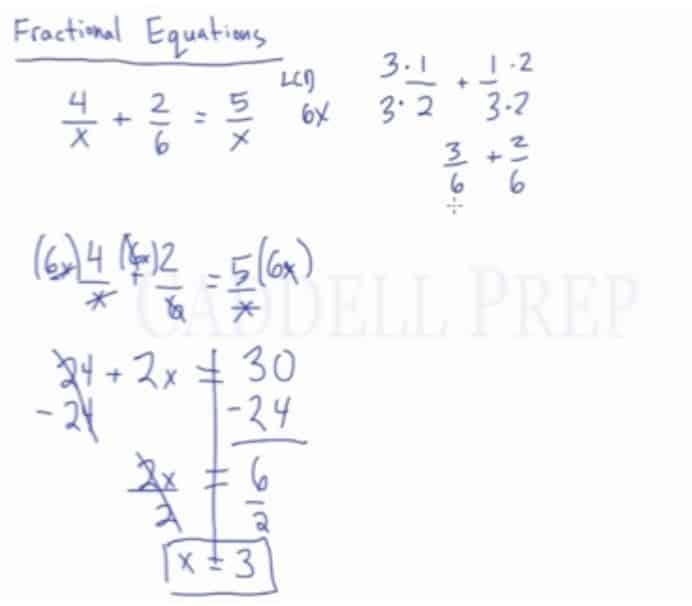 In this lesson, we’ll go over fractional equations. This is just an equation involving fractions. But it’s algebra. So, it’s going to be a little complicated. Let’s go back to the regular fractions for a second. Just a little side note. we need a common denominator. We can’t just add it the way it is. The common denominator for these is . In order to change the denominator by , we have to multiply the numerator and the denominator by the same number. In the first fraction, we have to multiply by and the second fraction has to be multiplied by . We’re going to use the same concept in solving fractional equations. First, we have to find the least common multiple of the denominators. So our least common denominator (LCD) is . But instead of getting the least common denominator and still having fractions, we’ll just multiply everything by the least common denominator. If we multiply everything by , things are going to get canceled out. And it’s not going to be a fractional equation anymore. It’s going to be regular equations. Now, we can cancel the denominators. Now, we can solve this like a regular equation. We want to isolate using inverse operations. So, for fractional equations, we have to find the least common denominator. But we’re not going to manipulate them to have a common denominator. What we’re going to do instead is to multiply each term by the least common denominator so that the denominator of each term cancels out. Then we end up with a new equation where we can solve for .